While surveying the shelves at the liquor store in anticipation of my New Year's Eve celebration, my eye was drawn to a rather distinctive green bottle which turned out to be Absinthe. I had known of it's ban in the past and was unaware that it was currently available. Absinthe has always had a mystique about it, drawn perhaps from it's purported hallucinogenic effects, it's Bohemian artist ties, and the aura of it's felonious past. 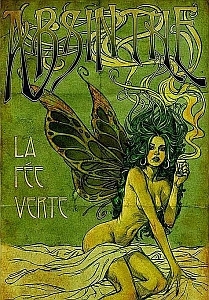 The allure of what is referred to as "la fée verte" (the green fairy) is strong, rife with a storied past which to me is the sine qua non of a good "spiritual" experience. And so, I decided to give it a try in the spirit (pardon the pun) of the New Year. Despite the licorice taste, it has little else in common with the liqueurs such as anisette, ouzo, etc. 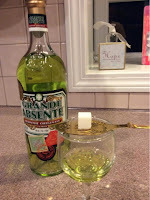 In fact, Absinthe is not traditionally bottled with added sugar and as such is truly a spirit and not a liqueur. 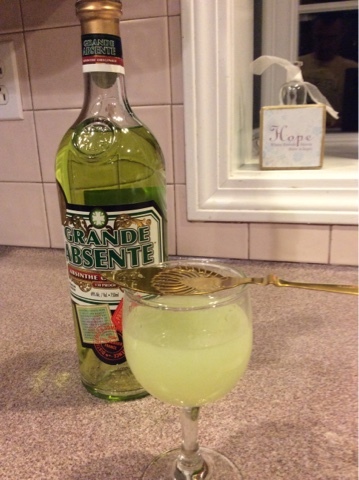 In fact, the production of Absinthe most resembles Gin in that it is an alcohol base with botanical flavorings. However, Absinthe is distilled to very high levels of alcohol varying from 45% to 74%, the latter being the one I chose to sample. And so I sip the past as I toast to the New Year. 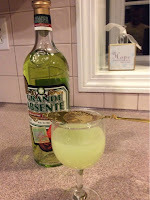 "Absinthe makes you crazy and criminal, provokes epilepsy and tuberculosis, and has killed thousands of French people. It makes a ferocious beast of man, a martyr of woman, and a degenerate of the infant, it disorganizes and ruins the family and menaces the future of the country." It was banned throughout much of Europe, Spain a glaring exception, around 1905 and here in the US in 1912. And so, England had her Mother's Ruin and France had her Green Fairy. Hemingway saw the bullfight as a metaphor of the struggle between life and death and the artistry and tragedy embodied in it. Facing death is somewhat life fulfilling for the matador, not so much for the bull. 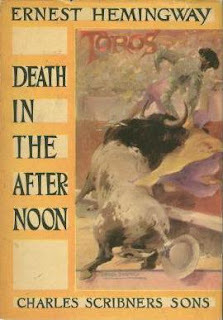 I surmise that is what attracted Hemingway to the bullfights in the first place, and perhaps Absinthe as well. The defining essence of Gin is juniper, while that of Absinthe is the botanical Wormweed. The oil of the wormwood plant, Artemisia absinthium, is indeed toxic to us humans. 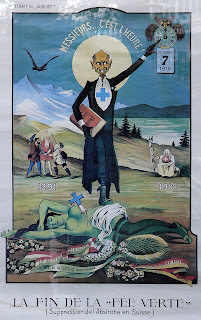 One of the main compounds contained in it is Thujone, once widely believed to be an active chemical in Absinthe responsible for it's professed hallucinogenic properties. But Thujone concentration in Absinthe is strictly controlled by the various authorities, and recent research suggests however, that the effects of Thujone in Absinthe are exaggerated and in reality have no significant effect. The sense of danger which led to its outlawing, and contributed to it's mystique has been largely eluted thanks to modern chemistry and distillation. The thought of drinking yourself to death I suppose was hauntingly beguiling to some, but it would be the 138 proof alcohol that did you in, not the mysterious ingredients of Absinthe. There is nothing like having a drink that requires a process leading up to it's consumption. The process is nearly as fulfilling as the spirit is delectable. One could drink it neat, but at the rather high ABV, your night would be over rather quickly. Also, the mixing process is said to bring out the flavors better, so why cheat yourself of some extra flavor. The more traditional or "French" method is to place a sugar cube in a slotted spoon over the glass. Iced water is then slowly poured over the sugar cube allowing it to dissolve. 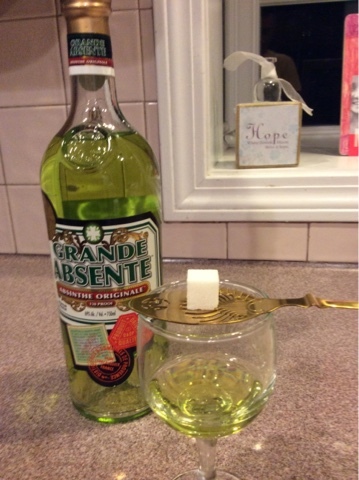 The mixing of the oils in the absinthe with the water turns the liquid to a pale green opaque color. The sugar serves to balance the bitterness of the herbs while the water draws out the herbal notes while at the same time diluting the alcohol to a more bourgeois level. 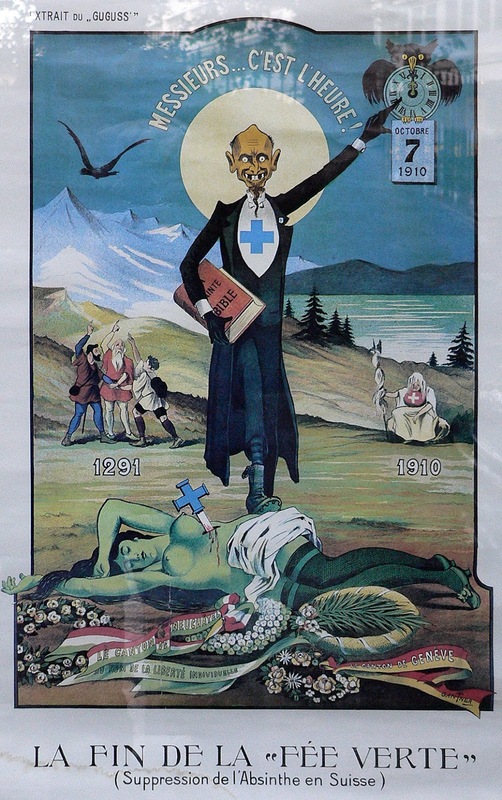 Numerous artists and writers living in France in the late 19th and early 20th centuries were noted absinthe drinkers. Painters Vincent van Gogh and Pablo Picasso, poets Verlaine and Rhimbaud, and more recent writers Oscar Wilde and Ernest Hemingway all partook of the green fairy. Perhaps they were seeking the "lucid drunkeness" or the ability to drink oneself sober attributed to Absinthe. Whatever the case, Absinthe has been the nectar of the muses for over a hundred years and it's legendary hallucinogenic and mind-altering effects remain entrenched in people's memory but perhaps are more nostalgic than real. Here is my Martini for tonight, minus the naked fairy in the glass. It seems so ironic to use Gin as a diluent.